The last few posts have discussed using a Zazzle RSS feed to do social media marketing, but these strategies can work using any RSS feed. The prior tutorials dealt with RSS Feeds and IFTTT, however, IFTTT does not connect to Google+ business pages. 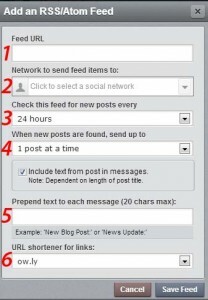 When you want to schedule to Google+ pages, you’ll need another path. 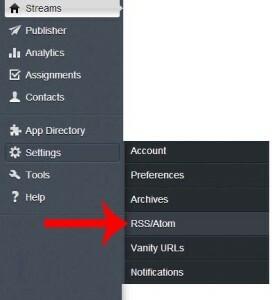 In this tutorial, we’ll again use a Zazzle RSS feed, but just remember, it should work with any RSS feed. Create 1 new product, see how it looks; make adjustments if desired. There are endless ideas and strategies for setting up this automation. When you are testing this out, remember that Zazzle can take up to 24 hours to create an item and then Hootsuite may take the full amount of time you have allotted using this form (1 hour to 24 hours), so you need to be patient and wait for your design to appear. The other factor that plays a role is how you code your Zazzle RSS Feed. See our coding tips here. If you’ve read our previous posts on Zazzle automation for social media, you may be wondering why we’re not using IFTTT.com again. It’s simple. IFTTT.com does not have a Google+ option. These numbers correspond to the numbered entries in the form on the left. Network: Here you can use the drop-down arrow and choose to send to any social media platform you have connected to Hootsuite. Choose Google+. (Hootsuite is not able to send both a link and image to all social networks, so you may need to do some testing to see if other social media networks display the posting in your desired fashion. 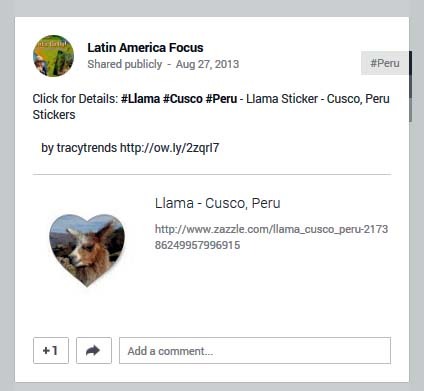 – We are pleased with the connection to Google+.) This feature is editable at any time. 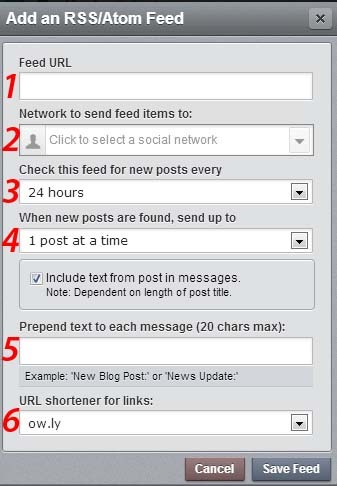 How Often: Choose how often you would like Hootsuite to check the feed for new posts. You can set the automation to every 1, 2, 3, 6, 12, or 24 hours. This can be edited later. Pre-Text: “Prepend Text to each message” – You can (and should) include up to 20 characters of text before each posting. This might be something like “New Item” or “New From XXXX” and change the XXXX to your company name. This helps appear less spammy, helps with branding, and if you keep your text unique for every autopost (be it from Hootsuite, a blog, etc. ), then you can track and troubleshoot any issues that arise. URL Shortener: You have a choice of URL shorteners to use. When you auto-post, the long URL is shortened. Your viewers on Google+ will be able to tell not only that you are using a autoposting feature, but that you are using it from Hootsuite. When automation is completed correctly, a Zazzle RSS feed…set to autopost a single item…to a Google+ business page…through Hootsuite…will appear to the viewer like this image, shown to the left. Hootsuite pulls in all the content information: URL shortener, title, price, store name, and image. The Hootsuite RSS atom does not pull in the Referral coding, so this is best used for your own products and will not help toward your Zazzle Volume Bonus (ZVB). The main advantage of Hootsuite auto-posting is: this is a fast, FREE, method for exposure of your designs. Every week or so, go into your Google Plus business page and click “Edit” on all your automatic postings. Next, add a # (hash tag) in front of a keyword. You might also enter additional keywords or synonyms with hash tags.